Try out fun team building activities on a wide range of leadership topics. 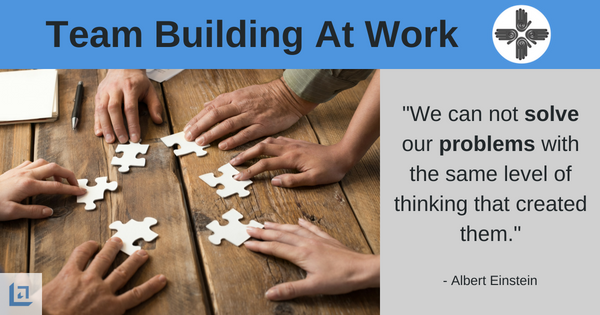 Our free eBook, Team Building At Work is available for immediate download. In this chapter we address the issue of problem solving and why it's important to coach your team to address problems quickly for a successful resolution. Effective problem solving skills is one of the most valuable assets a team can possess. Solving problems quickly and professionally within the team requires open and honest communication and a sincere desire to identify a solution that satisfies the needs of all parties involved. The best problem solvers are people who have clear intentions to come up with a solution that is a win-win. They do not respond with emotion, but address issues with a clear and thoughtful approach. They possess a high degree of common sense and good judgment. These traits are critical for leaders and team members. The skill of problem solving isn't always taught as part of a formal education, so leaders cannot assume that their team possess this valuable skill. Our fun team building activities provide ideas for teams to problem solve more effectively as they become better at identifying win-win solutions to touch challenges. "Again and again, the impossible decision is solved when we see that the problem is only a tough decision waiting to be made." Poor behavior and lack of performance are often the subjects of workplace issues. Leaders can help their employees to effectively deal with these types of workplace issues by setting clear expectations up front and coaching team members on why it's important to always communicate in a respectful and professional manner. Coach your team about the importance of increasing their awareness and sensitivity to others. 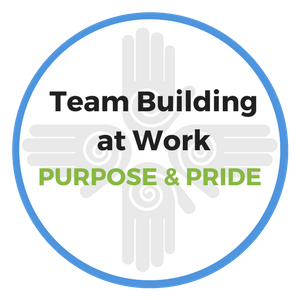 As the leader, you can utilize our fun team building activities to support an environment where team members value the different strengths of their co-workers. Having team members who are diverse, meaning different, makes a team stronger not weaker. Teach your team to recognize and appreciate each other's differences. Discuss how those unique attributes can add dimensions to the team that can provide a competitive advantage. You'll limit the number of problems on your team by keeping team members focused on helping and supporting each other. Purpose: To encourage team members to take time to effectively problem solve by creating win-win solutions to important challenges. Divide your team into groups of three or more. Assign each group to a specific problem that the team needs to solve. Provide the full scenario, pointing out the key stakeholders and their respective points of view. In each group, assign a timekeeper, a scribe (someone to take notes), and a crossing guard (Watch out for traffic). Each group will take a 30 minute walk outside. The goal here is to take your people outside their normal working environment and break up their morning routines. Critical thinking is supported as people are challenged to work outside their normal mode of operation. Let each group know that upon their return they will be expected to present their win-win solution to the larger group for consideration. Coming up with win-win solutions forces team members to identify what's important to all parties and to seek remedies that will be agreeable to everyone involved. At the end of each presentation, the group must also share something that they noticed for the first time outside during their Walk-A-Bout. The purpose here is to have some fun and add some creativity to the process. Reward and recognize those teams that provide the most unique and effective win-win solutions. Fun team building activities like this are simple, and can provide solutions you may not have ever thought about. Purpose: To teach your sales team that they must never short change themselves of new opportunities to sell their product or service. Thinking outside the box for added benefits can create huge upside potential for maximum sales and earnings. Instruct your team that their goal will be to package and promote women’s pantyhose as a totally new and different product. They will also need to identify a list of features and benefits that will appeal to a male market. Yes, you heard that right. The key to this task will be to unlock the imagination of your team so they will become totally open to ALL OPTIONS. After putting team members into small working groups, allow 20-30 minutes for groups to brainstorm and prepare their ideas. Each team will then be asked to make their sales presentation. Rest assured the ideas will keep you on the edge of your seat. Simple ideas like this provide leaders with fun team building activities that will keep the creative juices of your team flowing. After completing the presentations, point out to your team how interesting it is to hear so many different solutions to what at first seemed to be an impossible task. Through their collective creativity, they were able to effectively solve the problem assigned to them. Working together the team will show their ability to step up to the challenge at hand, and have fun in the process. Next time, use a similar exercise to address an important business challenge. With that same level of enthusiasm and creativity, instruct your team to continue their out-of-the-box thinking. Turn the team's focus toward how you can increase market share by attracting new target groups to your product or service. To download our free Team Building At Work eBook, providing fun team building activities and exercises, simply subscribe to our free newsletter. You will immediately receive a password that grants access to our entire leadership tools library.